Won't You Be My TeddyBunny Bear!!! I have written down the pattern I devised for my Block of Chocolate Socks. I always use 2.25mm needles and 72 stitches, but I have ‘reinterpreted’ the pattern for 2.75mm needles and 64 stitches if you prefer. I am thinking that excellent sock instructions abound, thus this pattern is the bare bones, so to speak!! Please leave a comment if the pattern is awry. Using 2.75mm/2.25mm needles, cast on 64 (72) stitches in K1,P1 rib using cable cast on and divide stitches evenly on the needles: 16/24/24 or 24/24/24. Join and work 12 rounds in rib. Change to the Block of Chocolate pattern and knit till required length is reached, ending with the 11th row if possible. I like my socks to be symmetrical, so before I start the heel I like to rearrange the stitches. You may, or may not, be so obsessed!! 64 stitches: Slip 3 Knit stitches from the end of the last round onto the new needle and then continue knitting thusly: P2, K6, P2, K6, P2, K6, P2, K3. You should now have 32 stitches on your heel needle. 72 stitches: Slip 5 Knit stitches from the end of the last round onto the new needle and then continue knitting thusly: P2, K6, P2, K6, P2, K6, P2, K5. You should now have 36 stitches on your heel needle. Leave the remaining stitches unworked on their needles and continue with heel pattern Row 2 and then work 35 more rows back and forth, or until the desired length is reached. S1, P 3/7, P2tog, p1, turn. Continue this shaping as set until you have 18/22 stitches, ending with a purl row. Needle 2 will continue with the BOC pattern as set. Your stitches should look like this if you have previously symmetricised them!!! The BOC pattern stops now and the toe is all plain knitting. Continue as set until you have 24/32 stitches , and then work decreasing Row 1 twice: 16/24 stitches. Arrange the stitches so you have 8/12 on each of 2 needles and then graft the stitches together, sew in the ends and you have finished one sock. Now make another and you have a pair!!! 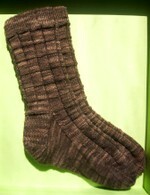 Thanks for sharing your chocolate socks pattern :) they are so yummy! that is so excellent! thanks for sharing! will have to try them some time soon! and no..half the words were changed for that song on my blog..but it was so funny i had to post it (Adam was laughing so hard he cried)..
You know I'm going to have to make these for my chocoholic mum! Great pattern and thank you for sharing it. mmmmm.....chocolate, I think I have some stashed. Me being more of a cat person recently my path has been crossed dogs...My BF found a lost jack russell last week and I swear if he had not found the owner I would have kept him. He was the same size as our cat ans equally as smoochie! Thanks for the pattern - very creative. Oh I could definitely eat that sock. Yum! hi cindy, do u still use 2.25mm needles to knit with the knittery cashmere sock yarn?? they are slightly thicker than the normal 4 ply sock yarn though? Thanks for the pattern - I have already bought my choc merino from The Knittery & just waiting for time (if I can find some) to knit this pair of must-knit-yummy socks! these socks do look wonderful Cindy Oh I do wish I could knit or should I say follow a pattern! Those cherry coconut eggs sound pretty yummy too! thank you for the birthday wishes for Isobel, the cake is Hello Kitty, a bit of a favourite here :) ps I looove the green socks too what a gorgeous green! oh much appreciated! Thank you! Hi, thanks for visiting Oh My! Your site is Delicious!!! Those socks are fantastic! And your dog are beautiful. I am hopefully going to become a Lab mummy later this year! Great pattern! I'll have to have my sister knit these for me!